John French is one of my favorite newer writers at Black Library, with a style that I would call a little more grounded. 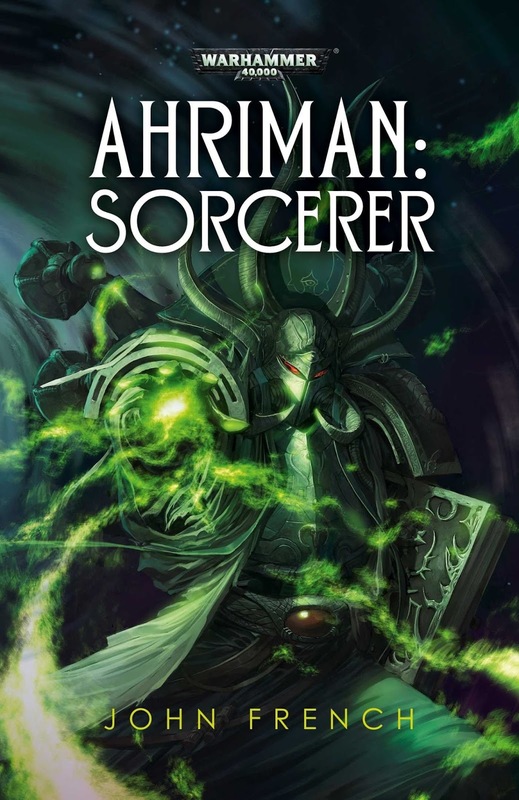 Ahriman: Exile was an amazing book and his follow up, Ahriman: Sorcerer is no different. What is it about this book that was so great? Sorcerer picks up an undetermined time after Exile left off. Ahriman is now firmly in control of a large Thousand Sons fleet. Still determined to right the wrong he committed with the Rubric he has called a meeting of warlords, many of them from other warbands and legions. He has heard of a secret artifact known as the Atheneum of Kalimakus and believes that with it he can learn where he went wrong in his grand spell and correct it. This novel pulls no punches and pretty much drops you straight into the story. There are a lot of characters that get referenced right away, so unless you just finished reading Exile, you may be a little lost at first. I know I was. I had to spend a bit of time remembering who several characters were, but as the story kept going I remembered enough from the first book to not get lost. One of the things I really like about John French's books is that they are not all about the action. The story and the characters are more important than the battles. This tends to lead to a bit more depth then in your standard Bolters blazing story. This method of storytelling seems to work very well for the members of the traitor legions in particular. They usually do not see themselves as straight up bad guys, but instead as people who have to do bad things to get what they want. It's for a goal, not for the sake of twisting your mustache while laughing manically. Ahriman's plan has many layers to it, which continue to unfold and reveal themselves as the novel progresses, just as any proper Tzeentchian plan should. The novel can skip around a bit with time, particularly in the beginning. This generally happens when it switches between Ahriman's story and that of the Inquisitors', Iobel and Izdubar. In fact, John French's use of time and how the Warp can twist and distort it was one of my favorite parts of the book. It's not utilized often, but when it is it's always handled very well and in a unique way. There is one element of Warp time that he utilizes which I have yet to see in any 40k fiction, despite it having been mentioned here and there before. Ahriman is definitely the standout character, with the most definition and depth. This is no surprise considering how well he was handled in Exile and he was also given some great groundwork in A Thousand Sons by McNeill. In this novel we start to see him transition even more from the altruistic, yet naive character he was during the Heresy into the grand sorcerer and boogeyman he is in the 41st millennium. It's done in a very believable manner as well, you can really see how he slowly started sliding in the direction that he did without him even realizing the inner moral compromises he was making. Another great character was Iobel, an Inquisitor who is hunting Ahriman and his warband. Is she really the hunter though, or the hunted? The twists and turns in the plot are a lot of fun to read and a mental duel between her and our title character was a particularly enjoyable scene to read. There are plenty of side characters here, who, although they may not get as much attention, feel as equally developed as our main ones. I definitely like Astraeos, the renegade Space Marine Librarian who teamed up with Ahriman in our first book and I eagerly await to see how his story ends. I really want to know which Chapter he is from. Cendrion, a Grey Knight, is another character who had little screen time, but really stood out to me. The list can go on and on with Ignis, a mathematically minded sorcerer; Kadin, Astraeos brother in arms; Izdubar, another Inquisitor in on the hunt; Carmenta, the ship's captain; and many more. I read somewhere that the plot is akin to watching Ahriman set up dominoes and then tipping the first one over. However, I would add that you weren't even aware that those dominoes were being set up until they start to fall and you have a chance to think back on it. 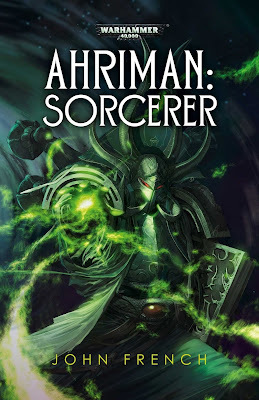 Ahriman: Sorcerer really is an excellent novel with tons of character, depth, intrigue, and just the right amount of action. I never got bored reading it and always wanted to keep going on to the next chapter. Just make sure you are really concentrating on what you're reading, especially at the start. There is so much going on, even in the quiet moments that if you are splitting your attention you may miss it. I highly recommend picking up this book, and if you haven't already, the first one as well. The final installment in the series is set to come out later this year and they even just released a sneak preview of it on the Warhammer App. I am definitely looking forward to seeing how this trilogy ends, I only hope that it's not the end of John French's take on Ahriman.